At first glance, Oakley's Radar Pace sunglasses look undeniably cool. But hidden inside is technology that turns the sunglasses into a voice-activated coach that answers questions and provides fitness training recommendations. It's like having Siri in your sunglasses. The sunglasses are expensive. At US$449, they have a hefty markup, but Oakley sunglasses and cool technology won't come cheap. The glasses will be handy for hard-core athletes, but Oakley is also targeting casual athletes. The smart glasses will start shipping on Oct. 1 in the U.S. and other countries. Radar Pace has sensors that can track heart rate, distance, cadence, speed, and other vital workout information. The data is synced with a smartphone connected to Radar Pace via Bluetooth, where an app called Radar Pace App monitors the workout, answers questions, and provides voice recommendations. Users hear the information through earphones in the sunglasses. A cool feature is the ability to ask questions through a microphone, with users getting answers back. The questions are passed on to the smartphone app, which formulates and sends back an answer to Radar Pace. The voice-activated system can convey daily workout plans, or answer questions that will provide real-time information on speed, race, metrics, and heart rate to people wearing Radar Pace. The smartphone app can analyze workout data in real time. 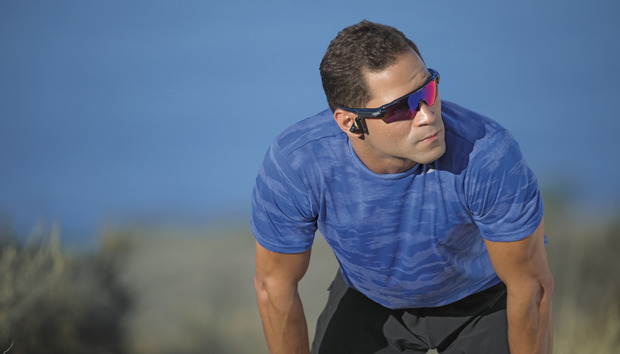 For example, the glasses can advise a runner to increase the pace, slow down, or end a workout. The mobile app interprets and answers queries through a natural-language processing engine developed by Intel called Real Speech. For example, a runner can ask questions like, "what's my heart rate?" or "what's my pace?" Voicing "time" or "distance" will prompt the app to convey the answers. The smart glasses are a result of a two-year alliance between Luxottica, which owns Oakley, and Intel, which developed the core technology and architecture. Intel has pushed for technology to be invisible in wearables, and that design philosophy was the main focus when designing Radar Pace. Many smart sunglasses for fitness are hitting the market. A notable competitor is Solos, which is a kind of Google Glass for athletes. Solos has a tiny heads-up display that shows metrics like heart rate, pace, distance, and cadence so athletes can see data in real time. It was used by U.S. cyclists in the recent Rio Olympics. But unlike Google Glass and Solos, the Radar Pace doesn't have a screen. A voice-activated system works better because information on a screen can be distracting when cycling or running, Oakley officials said. Also, the added-on tech hasn't looked cool in some smart glasses. The technology protruding out of Google Glass was so visible that it upset people who thought they were being spied on. Oakley and Intel came up with a design where the technology is as hidden as possible, though the headsets are clearly visible on the side. The smartphone app that works with Radar Pace also can pull data from other fitness apps and devices to formulate workouts. That's handy, especially when people like using Fitbit and other devices to track fitness data. The sunglasses weigh 56 grams and run for about four to six hours on a single battery charge. They have an accelerometer, gyroscope, and sensors to measure pressure, humidity, and proximity. The glasses have some cool add-on features. They can play your favorite music on the smartphone. You can take phone calls via Radar Pace, and the app works with Android and iOS devices. For Intel, the Radar Pace is a breakthrough in wearables. The chipmaker has a handful of wearable products on the market, but Radar Pace is the most important for the company. Unfortunately for Intel, the glasses don't use an x86 chip, but an embedded processor based on another architecture that Intel wouldn't specify. That also highlights a problem -- Intel's chips aren't used in many wearables partly because the company doesn't have the right processors in its portfolio. Intel is committed to developing chips for wearables, a representative said.